Margins button to select one of three preset margins for the report or to set custom margins on the Margins tab of the Page Setup dialog box. Orientation button to switch between Portrait and Landscape mode for printing. 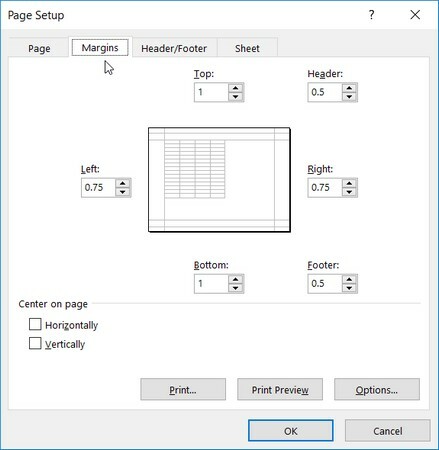 Size button to select one of the preset paper sizes, set a custom size, or change the printing resolution or page number on the Page tab of the Page Setup dialog box. Print Area button to set and clear the print area. Breaks button to insert or remove page breaks. Print Titles button to open the Sheet tab of the Page Setup dialog box where you can define rows of the worksheet to repeat at the top and columns of the worksheet to repeat at the left as print titles for the report. The Normal margin settings that Excel applies to a new report use standard top, bottom, left, and right margins of 3/4 inch with just over 1/4 inch separating the header and footer from the top and bottom margin, respectively. Frequently, you find yourself with a report that takes up a full printed page and then just enough to spill over onto a second, mostly empty, page. To squeeze the last column or the last few rows of the worksheet data onto Page 1, try selecting Narrow on the Margins button’s drop-down menu in Excel 2019. If that doesn’t do it, you can try manually adjusting the margins for the report from the Margins tab of the Page Setup dialog box or by dragging the margin markers in the preview area of the Print screen in the Backstage view (Press Ctrl+P and click the Show Margins button). To get more columns on a page, try reducing the left and right margins. To get more rows on a page, try reducing the top and bottom margins. To open the Margins tab of the Page Setup dialog box in Excel 2019, select Custom Margins on the Margins button’s drop-down menu. There, enter the new settings in the Top, Bottom, Left, and Right text boxes — or select the new margin settings with their respective spinner buttons. Adjust your report margins from the Margins tab in the Page Setup dialog box. Select one or both Center on Page options in the Margins tab of the Page Setup dialog box to center a selection of data (that takes up less than a full page) between the current margin settings. In the Center on Page section, select the Horizontally check box to center the data between the left and right margins. Select the Vertically check box to center the data between the top and bottom margins in Excel 2019. When you click the Show Margins button in the Print screen in the Excel Backstage view (Ctrl+P) to modify the margin settings directly, you can also massage the column widths as well as the margins. (To change one of the margins, position the mouse pointer on the desired margin marker (the pointer shape changes to a double-headed arrow) and drag the marker with your mouse in the appropriate direction. When you release the mouse button, Excel redraws the page, using the new margin setting. You may gain or lose columns or rows, depending on what kind of adjustment you make. Changing the column widths is the same story: Drag the column marker to the left or right to decrease or increase the width of a particular column in Excel 2019. Because many worksheets are far wider than they are tall (such as budgets or sales tables that track expenditures over 12 months), you may find that wider worksheets page better if you switch the orientation from Portrait mode (which accommodates fewer columns on a page because the printing runs parallel to the short edge of the page) to Landscape mode. Below, you can see the Print Preview window with the first page of a report in Landscape mode in the Page Layout view. For this report, Excel can fit three more columns of information on this page in Landscape mode than it can in Portrait mode. However, because this page orientation accommodates fewer rows, the total page count for this report increases from two pages in Portrait mode to four pages in Landscape mode. A Landscape mode report in Page Layout view. Excel’s Print Titles feature enables you to print particular row and column headings on each page of the report. Print titles are important in multipage reports where the columns and rows of related data spill over to other pages that no longer show the row and column headings on the first page. 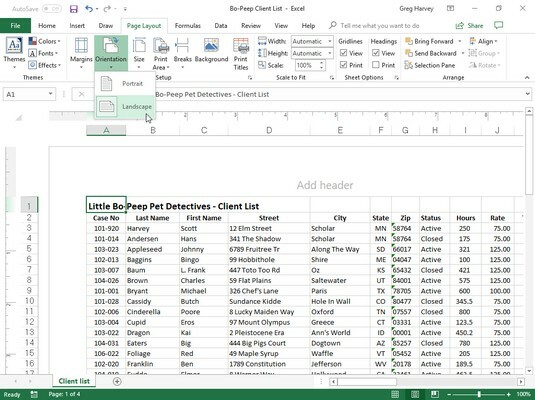 Don’t confuse print titles with the header of a report in Excel 2019. Even though both are printed on each page, header information prints in the top margin of the report; print titles always appear in the body of the report — at the top, in the case of rows used as print titles, and on the left, in the case of columns. Click the Print Titles button on the Page Layout tab on the Ribbon or press Alt+PI. The Page Setup dialog box appears with the Sheet tab selected. Click in the Rows to Repeat at Top text box and then drag through the rows with information you want to appear at the top of each page in the worksheet below. If necessary, reduce the Page Setup dialog box to just the Rows to Repeat at Top text box by clicking the text box’s Collapse/Expand button. 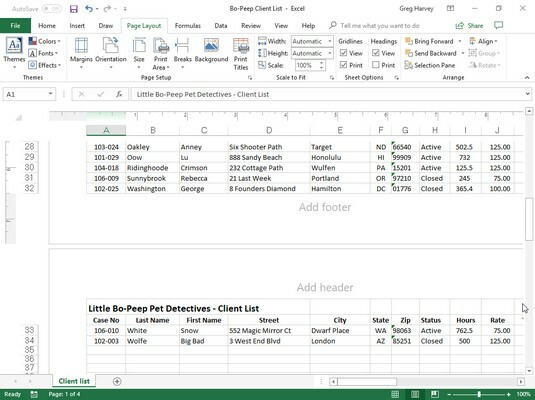 For the example shown below, the Collapse/Expand button associated with the Rows to Repeat at Top text box was clicked and then dragged through rows 1 and 2 in column A of the Little Bo-Peep Pet Detectives – Client List worksheet. Excel entered the row range $1:$2 in the Rows to Repeat at Top text box. Excel indicates the print-title rows in the worksheet by placing a dotted line (that moves like a marquee) on the border between the titles and the information in the body of the report. Click in the Columns to Repeat at Left text box and then drag through the range of columns with the information you want to appear at the left edge of each page of the printed report in the worksheet below. If necessary, reduce the Page Setup dialog box to just the Columns to Repeat at Left text box by clicking the text box’s Collapse/Expand button. Excel indicates the print-title columns in the worksheet by placing a dotted line (that moves like a marquee) on the border between the titles and the information in the body of the report. Click OK or press Enter to close the Page Setup dialog box. The dotted line showing the border of the row and/or column titles disappears from the worksheet. Specify the rows and columns to use as print titles on the Sheet tab of the Page Setup dialog box. 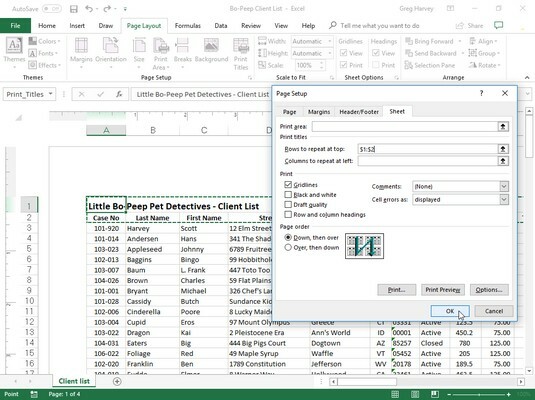 Above, rows 1 and 2 containing the worksheet title and column headings for the Little Bo-Peep Pet Detectives client database are designated as the print titles for the report in the Page Setup dialog box. In the image below, you can see the Print Preview window with the second page of the report. Note how these print titles appear on all pages of the report. Page 2 of a sample report in Print Preview with defined print titles. To clear print titles from a report if you no longer need them, open the Sheet tab of the Page Setup dialog box and then delete the row and column ranges from the Rows to Repeat at Top and the Columns to Repeat at Left text boxes. Click OK or press Enter. Learn more about Excel 2019 and the great features it offers.